I've been thinking pretty sentimentally about dogs recently, but I suppose I have that luxury because I've never had one of my dogs eat my Aston Martin. I don't actually own a dog-eaten Aston Martin, but Royston Grimstead of Somerset, UK can't say that, unfortunately. 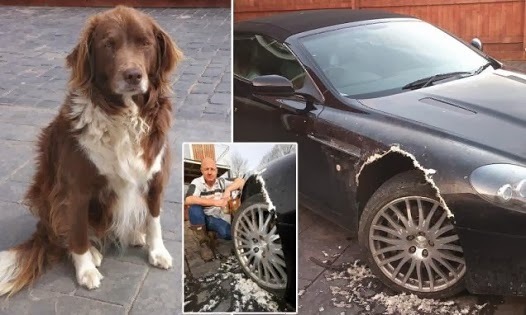 Yes, Mr.Grimstead's border collie/spaniel mix Luce decided that the black Aston Martin DB9 Volante looked just too damn delicious and ate an alarming amount of the fiberglass fender around the wheelarch. When Mr.Grinstead came home, he noticed the dog had an unusual amount of "white stuff" all over it, and initially assumed the dog had caught a bird. Until he saw his car. The dog didn't appear to be affected by all the fiberglass she ate, but she's no longer going to be living with Mr.Grimstead. Claims that the dog didn't get on well with his 10 year old border collie were suggested for the dog-firing, but I don't think the Aston-eating helped any. 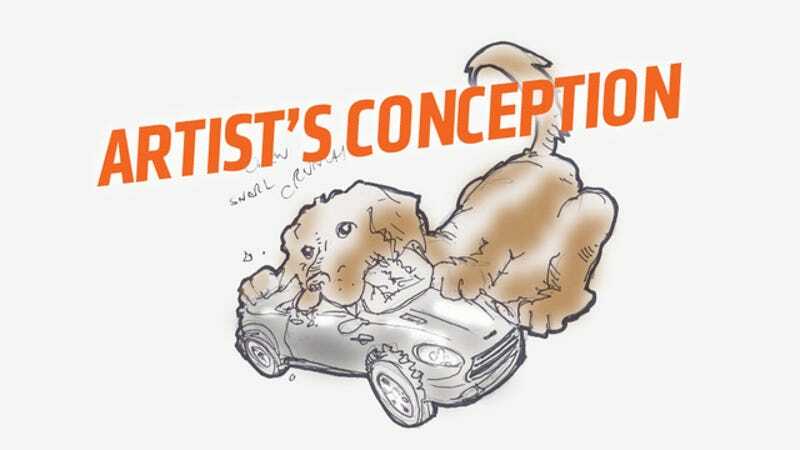 For actual images of the dog and the car and the chewing damage, click here, since we don't have the rights to those photos and I had to make that highly-accurate artist's conception. Luce has a new home in the same city, and insurance will cover the car repairs, so everything turned out basically okay. Aston Martin has been unusually quiet about the incident, and has not issued any statements or instituted any recalls for their car fenders being too delicious for dogs to resist. We at Jalopnik will look into a taste-test with some press cars to get to the bottom of this.